HBU Announces Largest Single Gift in History from Sherry and Jim Smith, Sr.
Sherry and Jim Smith, Sr. are providing a gift of $20 million to Houston Baptist University for the construction of classroom space and laboratory facilities to be used by the College of Science and Mathematics, the College of Engineering, and the School of Nursing and Allied Health. It is the largest single gift in the history of the University, and will allow for innovative learning and laboratory space in each area. 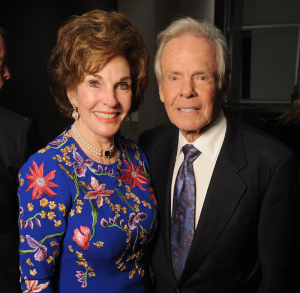 In appreciation of their gift, the University will name the building in the Smiths’ honor. The University announced the donation at a special reception in honor of Sherry and Jim Smith on Thursday, Dec. 13, at Morris House on HBU’s campus. The Smith family has been strong supporters of HBU for decades. Orrien Smith, Jim’s father, was among the 25 men who each made a personal donation to purchase the land for the then Houston Baptist College in 1958. These men are forever known as Founding Fathers of the University. Orrien Smith was the first chair of the University President’s Council in 1964. Jim Smith, Sr. served as a member of the University Board of Trustees from 1990 to 1999, and currently serves as an advisory trustee. Sherry is a lifetime member of The Guild, a dedicated group of women who support graduate scholarships in education and theology. The Smiths have served in a leadership capacity in the President’s Leadership Council. They were among the first donors of the University to fund an endowed chair, the John Bisagno Chair of Christian Origins in the School of Christian Thought. The Smiths also founded the Orrien R. Smith Endowed Academic Scholarship. In 2009, the couple funded a one-of-a-kind Létourneau pipe organ, the Smith Organ, installed in Belin Chapel. The Smiths are partnering with the Koch Foundation for significant annual gifts to the Morris Family Center for Law & Liberty. The Smiths were the recipients of the Spirit of Excellence Award in 1995 and the President’s Award in 2018. Their son, Jim Smith, Jr., served as a member of the HBU Board of Trustees. Their daughter, Tracey, earned a master’s degree from HBU in 2009.